NYC, New York, JUNE 25-27, 2017 –The hottest new specialty food products, producers, exhibitors and trends will be found at the 2017 Summer Fancy Food Show at NYC’s Jacob Javits Convention Center, January 22-24, 2017. That’s where Pereg Natural Foods (pereg-gourmet.com), a leading producer of premium, all natural spices and spice blends, ancient grains and quinoa products will debut its new line of Kaňiwa (baby quinoa) as well as new blends and flavor infused varieties of freekeh, teff, farro, basmati rice and quinoa, among other all-natural products and kosher certified products. Dark reddish-brown in color and about half the size of a tiny quinoa seed, kañiwa cooks up quickly to resemble a smaller version of red quinoa. Unlike regular quinoa, kañiwa doesn’t have saponins, the coating that gives quinoa a somewhat soapy, slightly bitter flavor if not rinsed properly. Kañiwa is actually easier to process due to the absence of saponins. (Note that all quinoa from Pereg is pre-rinsed and ready to cook from the package.) Another advantage kañiwa has over quinoa is that it’s an even better source of iron. Retail: 5 oz. boxes ($3.57); Re-sealable 16 oz. bags ($5.50). In addition, Pereg will feature new flavors of Quinoa side dishes, including ginger sesame, quinoa with lentils, quinoa with nuts and berries, and quinoa with roasted garlic in 6 oz boxes retailing at $3.99. New re-sealable 16 oz bags of grain from Pereg will include buckwheat, black lentils, baby quinoa, brown and ivory teff. 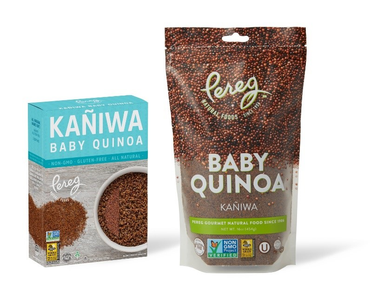 Today Pereg produces an array of all-natural products that includes ancient grains and ancient grain blends, gluten free pasta, couscous, rice, gluten-free cereal and much more. The company manufactures all its products from start to finish, controlling the quality from the sourcing until the product is packed and ready for the consumer. Pereg products are available at select retailers throughout the US and Canada, and directly to consumers on their website, www.pereg-gourmet.com. All Pereg products are kosher certified by both the Orthodox Union (OU) and CRC, are dairy and lactose-free as well as all natural, with no additives or preservatives. Many products are also certified gluten-free and non-GMO. Follow Pereg Natural Foods on Facebook.com/peregnatural, Twitter @pereggourmet and Instagram @peregnatural.